MAY 9, 2016 UPDATE: Johnny Depp apparently didn’t take the video apology too seriously. At a press conference in London yesterday promoting his new move, “Alice Through the Looking Glass,” Depp made fun of it. A video of the press conference posted by Reuters on YouTube has 137 thumbs down and only 51 thumbs up as of Monday morning. Here’s hoping it gets hundreds more thumbs-down. In May 2015, Johnny Depp, who was in Australia filming another sequel to “Pirates of the Caribbean,” and his wife, actress Amber Heard, thought they could get around Australia’s pet quarantine laws by flying their Yorkies into the country on a private jet and hiding them in a handbag at the airport. But the contraband canines, Boo and Pistol, were discovered not long after they arrived when an assistant took them to a groomer, who posted their photos on social media. Like many countries (and Hawaii), Australia has strict quarantine laws for imported pets in order to prevent the spread of diseases like rabies. People traveling with their dogs must first apply for a permit. The length of the quarantine period varies; in Australia, it’s a minimum of 10 days. When Australia’s Agriculture Minister Barnaby Joyce announced that Boo and Pearl would both be euthanized if they weren’t “buggered off back to the U.S.,” as he put it, it drew international ire, launching the social media campaign #WarOnTerrier. Heard flew back to California with Boo and Pistol on the private jet. Heard faced up to 10 years in prison and a maximum $75,000 fine for the illegal importation charge, and up to a year in prison and a maximum $8,000 fine for the false document charge. But those charges were dropped yesterday when Heard pleaded guilty to making a false statement to Australia immigration regarding the dogs, BBC News reports. Depp accompanied his wife to Southport Magistrate’s Court in Queensland, but was excused from providing evidence after his wife’s guilty plea. The judge gave Heard a one-month good behavior bond. Should she break the bond, she must pay $770. 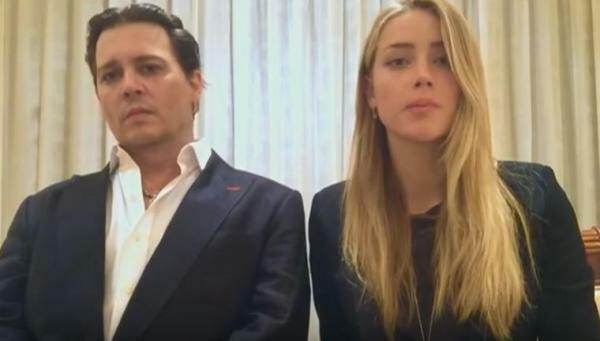 A very stoic Heard and Depp also appeared in a video, made public by the Australia Dept. of Agriculture, in which they apologize for smuggling their dogs into the country. The AFP news agency dubbed it “an awkward finale” to the case.